You know you’ve been working in music technology too long when plug-ins you remember the first time around are getting reissued as vintage classics! 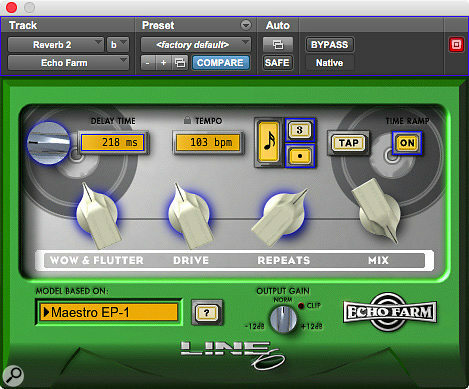 If there is such a thing as a classic plug-in, however, Line 6’s Echo Farm surely falls into that category. Along with their Amp Farm, it was among the very first attempts to model studio hardware in software form, and first time round, was only ever available as a TDM plug-in for Pro Tools Mix and HD systems. Amp Farm has since given rise to a range of steadily more sophisticated descendents, culminating in Line 6’s current flagship Helix Native amp modelling plug-in. Echo Farm, by contrast, was quietly discontinued many years ago and never ported to native platforms, and although models of some of the same delay units were included in Line 6’s Pod Farm suite, users accustomed to the original interface and sound sometimes struggled to get the best from them. In any case, neither Echo Farm nor Pod Farm has ever supported the newer Avid AAX plug-in format — until now. Echo Farm 3.0 is available only in the AAX Native format, and appears to be a straight-ahead port of the TDM plug-in. Indeed, it’s said to be able to open presets from the TDM version, and sessions that use it. My TDM rig has long since gone to the great machine room in the sky, so I wasn’t able to test this or compare the two directly, but as far as I can see, there are no features in the new Echo Farm that weren’t in the original. That means we get a graphical interface that was designed for the cathode-ray monitors of yesteryear and looks rather small on today’s retina screens, but given the simplicity of the plug-in, this is hardly a problem. It also means that most of the Echo Farm models are not stereo, in the sense of offering independent delay times for the left and right channels, although there is a ping-pong option and a digital delay with stereo output modulation. Line 6 have also resisted any temptation to add extra controls or models to Echo Farm, which still offers the same palette of 12 virtual echo units. Some of these emulate well-known analogue and digital hardware delays, including the Maestro Echoplex, Roland RE-101 Space Echo, Boss DM2, Electro-Harmonix Memory Man and TC Electronic 2290, while others were created by Line 6’s developers back in the day. What was once cutting-edge soon becomes commonplace, and most of us are no doubt awash with delay plug-ins; indeed, every DAW I can think of comes with perfectly serviceable echoes in its stock plug-in library. And at the full price, you’d be forgiven for opting for one of the myriad alternatives that has more modern features. However, from a purely sonic point of view, Echo Farm 3 stands up surprisingly well against the modern competition, and best of all, if you have a licence for the old TDM-only Echo Farm 2, you can upgrade at a greatly reduced price. Given how long Echo Farm has been around, that’s both surprising and very welcome, and a really nice gesture from Line 6 to reward loyal fans of the product. $199.99; upgrade from Echo Farm 2 $49.99.